This came up a few times where users experienced problems of remote power controlling their TTL flash. It may be a simple fix by following the correct way of powering on your devices - Top Down. 1. Connect the flash units to the V6. 2. Switch on the flash units in TTL mode. Then switch on the V6 in RX mode. 3. Choose the correct flash prof ile for each V6. One related question here ....is there a recommended power -on order for using a TTL flash attached to a V6 which is attached to the camera hot-shoe? Eg, is it 'Flash, V6, camera', or 'camera, V6, flash' etc .... ? Yes, especiallly, as most V6 users would need a TTL flash for remote power control. Always switch on the gear from the top down. Thanks, I'll follow that order from now. 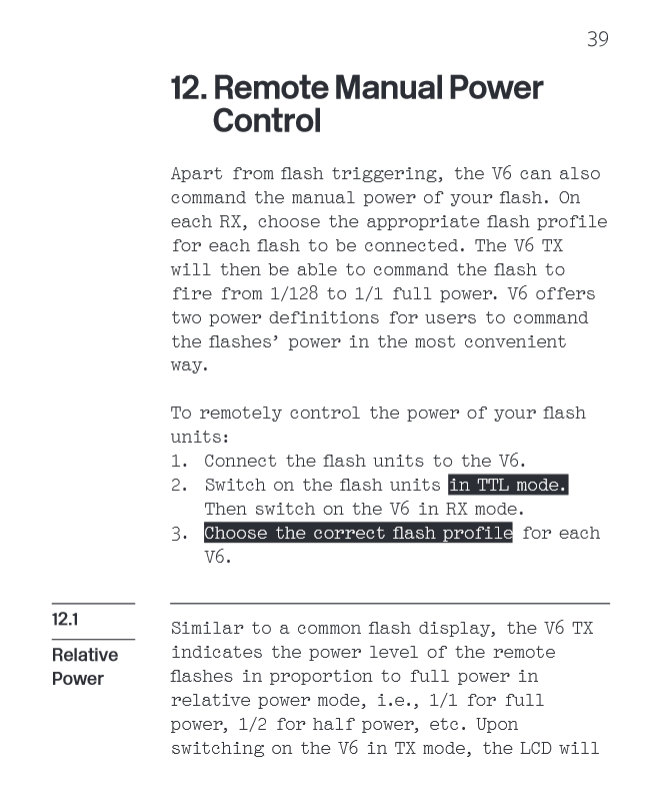 I have tried everything listed above, in the order listed and still cannot get the V6 to control my flash power. I downloaded the most recent firmware (as of 2/2/18) but nothing seems to work. I am using a Nikon 850D with either a SB24 or SB700 flash (neither work). I can't help but think I'm missing something but I sure can't tell what. Hi @TimHoover, what flash profile did you set for the two Nikon flashes? Are the flashes operating in TTL mode? And when you said "neither work", what actually happened? When you release shutter button on your D850, did the status LED blink green on both the V6 TX unit and RX unit(s)?